And they’re off. Democrats chose Libby Mitchell and Republicans picked Paul LePage as their party nominees Tuesday night, setting the field for the November contest to replace Gov. John Baldacci. Democrats chose Libby Mitchell and Republicans picked Paul LePage as their party nominees Tuesday night, setting the field for the November contest to replace Gov. John Baldacci. Mitchell, the Senate President, held back a field of three others, while LePage, the Mayor of Waterville, cruised to victory in a seven-man race. They will face independents Eliot Cutler, Shawn Moody and Kevin Scott in the fall. With 95 percent of precincts reporting Wednesday afternoon, Mitchell had 35 percent of the vote, followed by former Attorney General Steven Rowe with 23 percent, businesswoman Rosa Scarcelli with 22 percent and former Conservation Commissioner Pat McGowan with 20 percent. Rowe, after hugging his wife, Amanda, and other family members, conceded at 11:45 p.m. He said he called Libby Mitchell to congratulate her, and pledged to support her in the general election in November. “Regardless of the outcome, I’m a winner and I feel that way tonight,” Rowe said, thanking a crowd of more than 50 at Bull Feeney’s pub in Portland’s Old Port. “When we began this 12 months ago, I said it was going to be a journey. And the journey ends tonight,” he said. At Bayside Bowl in Portland – a new venue owned by Mitchell’s son Charlie and Sen. Justin Alfond, D-Portland – Mitchell’s supporters gathered in the bar area and bowled a few frames as they awaited results. Mitchell’s spokesman Jeremy Kennedy said the campaign’s ground game, which included a get-out-the-vote call from former President Bill Clinton, gave them hope for a win. Early on, when televised results showed Waterville Mayor Paul LePage with a commanding lead in the GOP primary, a cheer went up from Mitchell supporters. To Democrats, LePage would be a good opponent because they feel he is less likely to appeal to moderates and independents. The four Democrats in the primary rarely challenged one another throughout the campaign, with Mitchell, McGowan and Rowe having worked together in various state positions for many years. Scarcelli, who ran as an outsider, often told voters that she was a needed fresh face in a field of established Augusta insiders. “We’re calling it that because no matter what the results, we feel that Rosa has come in and done a great job. Here is someone with no background in politics who has run a terrific campaign against some very experienced politicians,” said Sarah Serling, a scheduler for the campaign. During the day, Rowe, Mitchell and the other candidates criss-crossed the state from polling place to polling place, shaking hands to remind voters one more time that they needed their support for victory. Mitchell, 69, the first female speaker of the Maine House, said earlier in the day that she wasn’t certain she’d win, but that she had received positive reactions from voters. In Lewiston, McGowan, 54, hit two polling places before hopping aboard his airplane to head for Bangor. He started the day in Fort Kent. Scarcelli and Rowe campaigned in southern Maine late in the day, greeting voters as people came to Portland and Scarborough to cast votes after work. Rowe, 57, stood outside the Italian Heritage Center and said hello to many familiar faces. In Scarborough, Scarcelli, 40, wore her signature orange sweater as she greeted voters. She felt encouraged because of the level of activity on her Twitter account and Facebook page, but she had no firm polling numbers to back it up. “You look even better in person than you do on TV!” a woman said as she walked in to vote. As she stood with a giant “Vote Here Tuesday” banner behind her, Scarcelli wrapped up a long day – along with many of the other 11 candidates – spent wooing voters across the state. Waterville Mayor Paul LePage surged ahead of his competitors Tuesday night to emerge at the top of a seven-way Republican primary in the Maine governor’s race. Les Otten, who had held second place for much of the night, conceded around 11 p.m.
With 95 percent of precincts reporting by Wednesday afternoon, LePage, 61, led the Republican pack with 38 percent of the vote. Otten followed with 17 percent and Peter Mills with 15 percent. The rest of the field was Steve Abbott with 13 percent, Bill Beardsley with 9 percent, Bruce Poliquin with 5 percent and Matt Jacobson with 3 percent. LePage will face Democrat Elizabeth Mitchell in the November general election, and as many as three independents, including Eliot Cutler of Cape Elizabeth, Kevin Scott of Andover and Shawn Moody of Gorham, who have qualified to be on the ballot. Moody said he’ll announce this morning if he’s running. The Republican primary was an expensive proposition this year. Candidates spent roughly $4.5 million in the race. LePage only spent $180,254, according to campaign finance reports. Only Jacobson, in last place, spent less. The big spender in the campaign was Otten, at $2.3 million. Otten raised about $122,550 and loaned his campaign $2.47 million. Jacobson conceded early, stepping to the podium at Binga’s Stadium in Portland to the cheers of about 40 supporters. “I think it is pretty clear we are not going to climb out of this hole,” he said. Mills told the crowd at his Portland campaign office that he was proud of the work his team did. 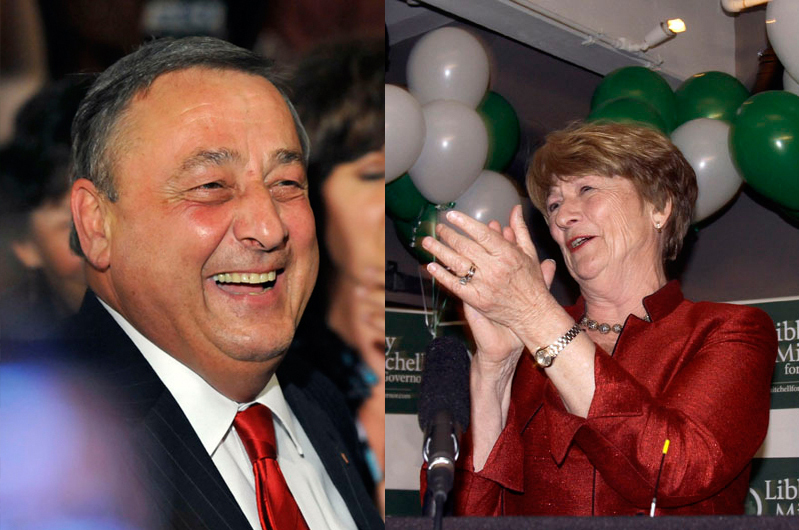 Abbott called LePage to concede before 11 p.m.
“I think he really ran a terrific campaign. He should be proud of the work he’s done and proud of the work his supporters have done,” Abbott said. “Regardless of the outcome, we’re going to feel it’s a job well done,” said Michael Pajak, Beardsley’s campaign manager. Poliquin, of Georgetown. said the results were disappointing. “The good part is the dialogue in this state has changed for the better. We’re now talking about being fiscally responsible,” said Poliquin. Scott, another independent candidate, had similar sentiments. Staff Writers Meredith Goad, David Hench, Jenn Menendez and John Richardson contributed to this report.